Although the coordination complex of the present invention is capable of achieving high levels of odor reduction, it is sometimes desired to further enhance the level of odor reduction through the use of high-surface area particles as a carrier for the complex. When utilized, the high surface area of such particles may provide a further method of reducing odor. The particles may be formed from a variety of materials, including, but not limited to, silica, alumina, zirconia, magnesium oxide, titanium dioxide, iron oxide, zinc oxide, copper oxide, organic compounds such as polystyrene, and combinations thereof. The particles may have a surface area of from about 50 square meters per gram (m2/g) to about 1000 m 2/g, in some embodiments from about 100 m 2/g to about 600 m2/g, and in some embodiments, from about 180 m2/g to about 240 m2/g. Surface area may be determined by the physical gas adsorption (B.E.T.) method of Bruanauer, Emmet, and Teller, Journal of American Chemical Society, Vol. 60, 1938, p. 309, with nitrogen as the adsorption gas. The effectiveness of the odor control composition of the present invention to adsorb odorous compounds was demonstrated. A polyethyleneimine solution was initially prepared by dissolving 3.3 grams of branched polyethyleneimine (obtained from Polyscience, MW=10,000 daltons) in 900 milliliters of deionized water. Thereafter, 335 milligrams of copper chloride (obtained from Aldrich, 97 wt. %) was added to the polyethyleneimine solution. Upon addition of copper chloride, the solution turned deep blue, indicating the formation of a coordination complex. A piece of a Scott® paper towel was then immersed in the solution for 1 minute and allowed to dry in air. The solids add-on level was 5.8%. The product was tested for odor adsorption using 1 microliter of ethyl mercaptan (0.839 milligram) as described above. The % odor reduction was determined to be 85.4%. In a parallel test, a control sample (piece of untreated Scott®) paper towel) reduced only 11.0% odor. The effectiveness of the odor control composition of the present invention to adsorb odorous compounds was demonstrated. 250 milliliters of an aqueous solution containing 1.33% PEI (obtained from BASF, MW=25,000 Daltons) and 0.36% CUCl2 were mixed with an ethanol solution containing 10% of 1,4-butanediol diglycidyl ether. The resulting solution contained 0.18% CuCl2, 0.66% PEI, and 5% of the diepoxide. A piece of a Scott® paper towel (3318.1 milligrams) was immersed in the above solution, which was heated to boil (80-85° C.) for approximately one hour. The paper towel was subsequently washed with three portions of 200 milliliters of ethanol, followed by three portions of deionized water. The towel was then allowed to dry in air for 24 hours. The weight of the paper towel after treatment and drying was found to be 3436.4 milligrams, and therefore the solids add-on level was 3.6%. 150 milligrams of the paper towel was tested for odor reduction as described above using 1 microliter of ethyl mercaptan. It was determined that the paper towel had an odor reduction of 39.2%. The effectiveness of the odor control composition of the present invention to adsorb odorous compounds was demonstrated. A treating solution was prepared by dissolving 1 gram of PEI (Lupasol WF from BASF, MW=25,000 Daltons) and 500 milligrams of CuCl2 in 200 milliliter of water, followed by adding 50 milliliters of a crosslinking agent (Lupasol SC-86× from BASF). A piece of a Scott® paper towel was soaked in the treating solution for 1 minute and hung in the fume hood for ten minutes to allow the liquid to drip. The wet towels were then transferred to an oven with a set temperature of 95° C. The towels were kept in the oven for approximately one hour, and were then washed with deionized water three times, followed by drying in air for 24 hours. The solids add-on level was 18.5%. A piece of Scott® paper towel of the same size as described in Example 8 was immersed in 0.1 wt % CuCl2 solution for 1 minute and allowed to dry in air. The add-on level was 2.8%. Another piece of Scott® paper towel was immersed in an aqueous solution containing 0.1% CuCl2 and 0.66% PEI (from BASF, MW=25,000 Daltons). The paper towel was allowed to dry in the air. The paper towels, along with those obtained in Examples 6 and 7, were immersed for 24 hours in separate beakers, each containing 30 milliliters of deionized water. The approximate weight of each paper towel was 870 milligrams. The supernatants were filtered to remove fibers detached and analyzed for the content of the leached copper. The content of copper was determined by ICP-Optical Emission Spectroscopy. Table 4 below summarizes the test results. The effectiveness of the odor control composition of the present invention to adsorb odorous compounds was demonstrated. A treating solution was prepared by dissolving 1.8 grams of PEI (Lupasol WF from BASF, MW=25,000 Daltons) and 1.08 grams of CuCl2 in 300 ml water, followed by adding 2.0 milliliters of a crosslinking agent (Lupasol SC-86× from BASF). A piece of a Scott® paper towel was soaked in the treating solution for 1 minute, and hung in a fume hood for ten minutes to allow the liquid to drip. The wet towels were then transferred to an oven with a set temperature of 95° C. The towels were kept in the oven for approximately one hour and were washed with deionized water three times, followed by drying in air for 24 hours. The add-on level was 4.3%. The effectiveness of the odor control composition of the present invention to adsorb odorous compounds was demonstrated. A treating solution was prepared by dissolving 1.8 grams of PEI (Lupasol WF from BASF, MW=25,000 Daltons) and 1.08 grams of CuCl2 in 300 milliliters of water, followed by adding 1.0 milliliter of a crosslinking agent (Lupasol SC-86× from BASF). A piece of a Scott® paper towel was soaked in the treating solution for 1 minute, and hung in a fume hood for ten minutes to allow the liquid to drip. The wet towels were then transferred to an oven with a set temperature of 95° C. The towels were kept in the oven for approximately one hour and were washed with deionized water three times, followed by drying in the air for 24 hours. The add-on level was 4.2%. contacting said coordination complex with an odorous compound, said transition metal providing one or more active sites for capturing said odorous compound. 3. A method as defined in claim 1, wherein said polydentate compound is water-soluble. 4. A method as defined in claim 1, wherein said polydentate compound contains positively charged ligands. 5. A method as defined in claim 1, wherein said polydentate compound contains one or more primary amines, secondary amines, tertiary amines, or combinations thereof. 6. 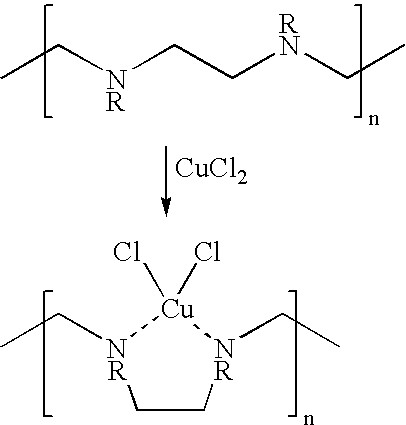 A method as defined in claim 1, wherein said polydentate compound is a polyalkylimine. 7. 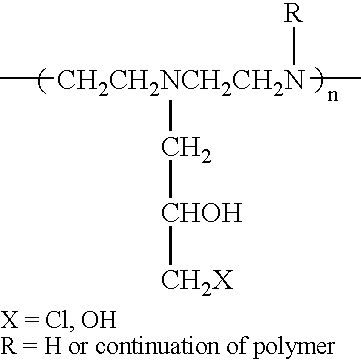 A method as defined in claim 6, wherein said polydentate compound is polyethyleneimine, polypropyleneimine, or a dendrimer thereof. 8. A method as defined in claim 1, further comprising crosslinking said polydentate compound. 9. A method as defined in claim 8, wherein a crosslinking agent facilitates said crosslinking of said polydentate compound. 10. A method as defined in claim 9, wherein said crosslinking agent is selected from the group consisting of polyhydric alcohols, polyaziridines, epoxies, haloepoxies, polyaldehydes, polyisocyanates, and combinations thereof. 11. A method as defined in claim 10, wherein said crosslinking agent is an epoxy that contains at least two epoxide groups. 12. A method as defined in claim 10, wherein said crosslinking agent is epichlorohydrin. 13. A method as defined in claim 1, further comprising combining high-surface area particles with said transition metal and said polydentate compound, said particles acting as a carrier for said coordination complex. 14. A method as defined in claim 13, wherein said particles are formed from silica, alumina, or combinations thereof. 15. A method as defined in claim 13, wherein said particles have an average size of less than about 100 nanometers and a surface area of from about 50 to about 1000 square meters per gram. 16. A method as defined in claim 13, wherein said particles have a negative zeta potential. 17. A method as defined in claim 1, further comprising applying said coordination complex to a substrate. 18. A method as defined in claim 17, wherein said substrate comprises a nonwoven, woven, or paper web. 19. A method as defined in claim 17, wherein said substrate comprises cellulosic fibers. 20. A method as defined in claim 19, wherein said coordination complex is chemically grafted to one or more molecules present on said substrate. contacting said substrate with an odorous compound, said transition metal providing one or more active sites for capturing said odorous compound. 23. A method as defined in claim 22, wherein said polyalkylimine is polyethyleneimine, polypropyleneimine, or a dendrimer thereof. 24. A method as defined in claim 22, further comprising crosslinking said polyalkylimine. 25. A method as defined in claim 22, wherein said coordination complex is chemically grafted to one or more molecules present on said cellulosic fibers. 26. A method as defined in claim 22, further comprising combining high-surface area particles with said transition metal and said polyalkylimine, said particles acting as a carrier for said coordination complex. 27. A method as defined in claim 26, wherein said particles are formed from silica, alumina, or combinations thereof. 28. A method as defined in claim 26, wherein said particles have an average size of less than about 100 nanometers and a surface area of from about 50 to about 1000 square meters per gram. 29. A method as defined in claim 22, wherein said odorous compound is selected from the group consisting of mercaptans, ammonia, amines, sulfides, ketones, carboxylic acids, aldehydes, terpenoids, hexanol, heptanal, pyridine, and combinations thereof. 30. A method as defined in claim 22, wherein said polyalkylimine contains positively charged ligands. 31. An odor control composition comprising a coordination complex formed between a transition metal and a polydentate compound, said transition metal being selected from the group consisting of scandium, titanium, vanadium, chromium, manganese, iron, cobalt, nickel, copper, zinc, silver, gold, and combinations thereof, wherein said transition metal provides one or more active sites for capturing an odorous compound. 32. An odor control composition as defined in claim 31, wherein said polydentate compound contains positively charged ligands. 33. An odor control composition as defined in claim 31, wherein said polydentate compound contains one or more primary amines, secondary amines, tertiary amines, or combinations thereof. 34. An odor control composition as defined in claim 31, wherein said polydentate compound is a polyalkylimine. 35. An odor control composition as defined in claim 31, wherein said polydentate compound is polyethyleneimine. 36. An odor control composition as defined in claim 31, wherein said polydentate compound is polypropyleneimine. 37. 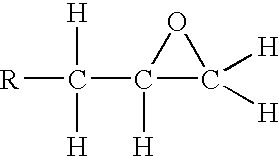 An odor control composition as defined in claim 31, wherein said polydentate compound is a dendrimer. 38. An odor control composition as defined in claim 37, wherein said polydentate compound is a dendrimer of polyethyleneimine, polypropyleneimine, or combinations thereof. 39. An odor control composition as defined in claim 31, wherein said polydentate compound is crosslinked. 40. An odor control composition as defined in claim 31, further comprising high-surface area particles that act as a carrier for said coordination complex. 41. An odor control composition as defined in claim 40, wherein said particles are formed from silica, alumina, or combinations thereof. 42. An odor control composition as defined in claim 40, wherein said particles have an average size of less than about 100 nanometers and a surface area of from about 50 to about 1000 square meters per gram. 43. A substrate for reducing odor, said substrate being applied with an odor control composition that comprises a coordination complex formed between a transition metal and a polydentate compound, said transition metal being selected from the group consisting of scandium, titanium, vanadium, chromium, manganese, iron, cobalt, nickel, copper, zinc, silver, gold, and combinations thereof, wherein said transition metal provides one or more actives site for capturing an odorous compound. 44. A substrate as defined in claim 43, wherein said polydentate compound contains positively charged ligands. 45. A substrate as defined in claim 43, wherein said polydentate compound contains one or more primary amines, secondary amines, tertiary amines, or combinations thereof. 46. A substrate as defined in claim 43, wherein said polydentate compound is a polyalkylimine. 47. A substrate as defined in claim 43, wherein said polydentate compound is polyethyleneimine, polypropyleneimine, or a dendrimer thereof. 48. A substrate as defined in claim 43, wherein said polydentate compound is crosslinked. 49. A substrate as defined in claim 43, wherein said coordination complex is chemically grafted to one or more molecules present on said substrate. 50. A substrate as defined in claim 43, wherein said odor control composition further comprises high-surface area particles that act as a carrier for said coordination complex. 51. A substrate as defined in claim 50, wherein said particles are formed from silica, alumina, or combinations thereof. 52. A substrate as defined in claim 50, wherein said particles have an average size of less than about 100 nanometers and a surface area of from about 50 to about 1000 square meters per gram. 53. A substrate as defined in claim 43, wherein the substrate comprises a nonwoven, woven, or paper web. 54. A substrate as defined in claim 43, wherein the substrate comprises cellulosic fibers. 55. A substrate as defined in claim 43, wherein the solids add-on level of said odor control composition is from about 0.001% to about 20%. 56. An absorbent article that comprises the substrate of claim 43. 57. An absorbent article as defined in claim 56, further comprising at least one liquid-transmissive layer and a liquid-absorbent core, wherein said substrate forms at least a portion of said liquid-transmissive layer, said liquid-absorbent core, or combinations thereof. 58. An absorbent article as defined in claim 57, wherein the absorbent article includes a liquid-transmissive liner, a liquid-transmissive surge layer, a liquid-absorbent core, and a vapor-permeable, liquid-impermeable outer cover, said substrate forming at least a portion of said liner, said surge layer, said absorbent core, said outer cover, or combinations thereof. 59. A paper product that comprises the substrate of claim 43. 60. A facemask that comprises the substrate of claim 43. ITPD980177A1 (en) 1998-07-15 1998-10-13 Marnia S P Z O O Document receipt and payment document replacing cash.